Down the years Cross Rhythms have chronicled the globe-trotting life and times of Coventry-based singer/songwriter Rob Halligan. In 2005 we caught up with him in New York when he was filming at the desolate Ground Zero site where he'd lost his father in the Twin Towers terrorist attack. In 2009 we'd caught him in concert in Scotland with similarly name American singer/songwriter Bob Halligan. Later that year he told us of his life-changing experiences of a mission visit to Bangladesh. But quite a lot has happened to the songsmith since then, most significantly of all his recent decision to "go full-time" therefore abandoning such occasional activities as working in a cheese factory which had been such a rich source of on-stage jokes and reminiscences. Clutching a newly bought guitar the singer/songwriter held the small-but-perfectly-formed audience at a house concert in Birmingham spellbound with his songs of faith and justice. But before his loop pedal-driven songs began pouring forth he spoke to Cross Rhythms about his life and recent activities. Tony: In 2014 you released the 'Love Come Down' album. What sticks in your mind about that album? Rob: It was launched at the last gig we ever did with After The Fire. It was in Coventry; it was packed, it was sold out. It was probably the only time I've played at a venue where before the gig there was a queue round the building of people waiting to come in. It was so cool. We had a brilliant night; we opened with an After The Fire set and then we had the album set. The title track was the opening song. It was a time when I was getting a lot more comfortable; I'd settled in working at Scotland's Foundry Music Lab where I was doing recordings so I was working with Graeme Duffin and Sandy Jones. I went into the recording with all these ideas that I knew I could pitch at them and I knew that they would be able to do them. I had a load of new songs but I also decided to re-record a couple of old songs - so "Dancing With Seagulls" and "Streets Of This Town" we re-recorded and they are on this album as well. I call them 10th anniversary recordings of those songs. It is one of my favourite albums up to now, I think. On 'Love Come Down' was "I Can't Make You Walk' which got BBC Radio 2 play. Tony: Your next album was 'Wild Horses'. Rob: I'd started getting into the idea of writing songs with choruses that were catchy enough for the audience to sing along to and so from 'Love Come Down' onwards it's helped fashion my live show as well. After 'Love Come Down' we recorded 'Wild Horses' in Scotland as well. I'm really happy with a lot of the songs on there. A couple of the songs I'm not happy with at all. There are pros and cons of being an independent musician. You can decide what goes; you haven't got a record company or a record executive telling you don't put that on there, that's not going to work. Tony: So, what you're saying is, when you write a song you immediately think this is one of the best things I've ever done and if you're not careful you get to record it. Rob: I tend to try songs out first. With 'Wild Horses' I tended to avoid what I call 'churchy' songs. I do write songs for church, for worship, sometimes. I try to avoid putting any of them on my albums but I did put a couple on 'Wild Horses' and I don't think it worked. So that's what let that album down. But there are some really good songs on there. You can follow the influences of who I've been listening to at the time as well. Around that time I'd been listening to Dougie MacLean, a Scottish singer/songwriter. I'd learned a song of his, "Ready For The Storm", which is a fantastic song. I spent ages working out how he played it and realised that he played it in an open C tuning. So I worked it out and learnt it and then I thought I can't just have one song in that so I wrote lots of songs in that tuning. "Wild Horses" was the first song in that tuning and it brought a completely new feel to the way that I was writing. On the journey of songwriting you follow it through albums and I think you can tell what I've been listening to a lot of the time. I tend to do the album and then gig the songs. The problem with doing that is, the songs then sort of develop as you gig them, and so they change slightly from when you first do them. But that's okay; that's the nature of it. That's why I revisit some of them sometimes. Tony: You did about 45-50 gigs in 2017 but this year you've done a lot, lot more. Rob: Yes, well, this year I went full-time. I've had part-time jobs for the past 10 years, but this year I've actually gone full-time. So sticking my neck out and seeing if I can actually make this work. And it is. I've got quite a healthy tour in the making for the first part of next year, so that's really good. It's a solo tour, called We All Write The Songs, after the new album. Tony: Getting back to your discography, in 2017 you released an unusual album, 'One Day'. Rob: It was a little bit different because I didn't record it up in Scotland. I recorded it with a mate, Chris Hunt, who lives locally to us in the Midlands, at Pigsty Studios. 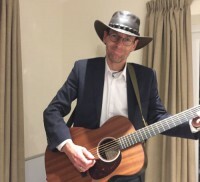 I was doing a gig, a headline spot at a folk festival, and I didn't have anything that I thought I could sell, because I don't think I'm a folk singer. And I don't know how I managed to get this headline slot. I thought, I need something, just more acoustic, so I did some covers of a Dougie McClain song, and I put that on there, a Mike Scott song. So I recorded this album 'One Day' in one day, we just did one take of everything and put that together. Which was great, because it was a new way of doing it, and it came out surprisingly well! Tony: Then there was 'We All Write The Songs', also in 2017. Rob: That was recorded back up in Scotland. The title track was actually written for that folk festival, because I needed a song with a sing-along chorus for folkies to sing. It was a hit there, and we recorded it. But it came out of the idea that all of us have a book in us, a story, and I thought, 'well, actually, all of us have a song in us.' I see my albums as biographical of where I'm at in my life. Not just the styles of music, but the things that I go through and write about, and I realised that people I meet, things that I go through, write the songs for me. I just then somehow have to put it together and make it into something that you can listen to. And so the idea behind the song was I would just look at people who've influenced me over my life. Whether they were people who played music and I'd listened to their music, or people who had touched my life in some other way, for better or worse. That where "We All Write The Songs" came from. Tony: What about the recording of 'We All Write The Songs' album? Rob: For this album I said to Graham, "We've got four people in this band, we can't have more than four people." It's either two guitars, bass and drums, or a guitar, bass, drums, keys, or whatever. I think it's much more representative, much more honest, in the songs that come out. I've been thinking a lot about the Psalms in the last year or so, and although this isn't a worship album, it kind of follows some of those patterns. I think it was Tozer who said Christians don't tell lies, they sing them. I don't necessarily agree with that, I think we sing a lot of truth, we're just not very honest about it. We might sing "I'm going to follow you all the days of my life" or whatever, and actually you don't feel like you are going to follow him. Or you're going to sing "Oh God, I know you're always there" but actually we don't know that God's always going to be there. We have doubt, we have struggles. I was looking at the Psalms, and Psalm 51, we sing "Create in me a clean heart," a brilliant Psalm, an absolutely brilliant Psalm, but we never sing the bit before it, and we never sing the bit after it, which is "God, I know where I've been, I've really messed up, I've screwed up, I've made a mess of things. So create in me a clean heart, and when you've created in me a clean heart I'm going to tell everyone about your ways." But we concentrate so often on the good bits, so I wanted to write something. . . No, I tell a lie. I didn't go out to write it. Just thinking about it influenced my writing to say, "Actually, I'm just going to say it how it is." The fact that things are painful sometimes, and sometimes there aren't the answers. So there's a song called "When Heroes Fall", which is what it says. It's rubbish when people that you looked up to mess up, which we hear about all the time in the news and happens in our own lives. There's a song on it called "Hold You Tonight" which talks about "I can't promise that it's going to be okay, I can't promise that we're going to sort everything out, but I will be here. I'm going to stay here through thick and thin, but it might still be horrible." You know, sometimes you have to say that. Tony: Now, the increasing number of gigs you do, would you say that a high percentage of the people in the audience are Christians, or would you say you've got no idea? Rob: I'm really fortunate with having these links to the folk scene, because I think I would get really frustrated if I was just singing to Christians all the time. But saying that, I think it's important. I wrote a song once called "Another Fine Mess"; it's songs like that which I think are particularly for the Church, which talks about our doubts and, like I said, honesty about what we sing. I used to think I don't want to sing to Christians, I don't want to be in churches, but actually, there's a lot of hurt in the Church, there's a lot of dishonesty, we're comfortably numb sometimes. Sometimes there are things we need to deal with and truths we need to face up to in the Church. The Church is a mess, in a lot of ways. Tony: If you went in to your average church and sang a lament, do you think they could they take it? Rob: That's interesting, because I'd occasionally run retreats up at a place called Scargill House in Yorkshire, and one of the ones I'm doing next year is on lament in worship. Last week I was listening to the Archbishop of Canterbury talking about various things at a conference in London. He said we need to learn how to lament positively. I think there's so much truth in that, because we think, lament, oh goodness me, this is going to be heavy, but actually doing that and learning how to do that in the right way is, I think, what the Church needs. Tony: You visited Lambeth Palace recently. Tell me about that. Rob: (laughs) There was a conference down in Lambeth Palace on new monasticism. That's something I'm interested in. I've lived in a Christian community before and got stung by it in many ways. But I still think that there is a need and a value, and the beautiful thing about community is that it can be done well, and I think that's important. So this conference was an Anglican conference, so it was very focused towards the Anglican church. But it was looking, broadly speaking, at communities and the way we can have some kind of shared lifestyle. It was interesting hearing Justin Welby speak about his priorities, which are reconciliation, evangelism and community. He says the heart of community is where the prayer takes place. And that's the root of it. You can have communities that are together, praying, and living out a prayerful lifestyle. Tony: I spoke to an American musician and pastor a few years ago, he told me about the early days of his community called Jesus People USA, and how what had started as a church community almost turned into a cult. Rob: Interestingly, it was one of the things being talked about. The question that Justin asked was how do we stop the charismatic leader becoming the cult leader? It was very healthy talking about it because there was a lot about the healthiness of deconstruction. How things can deconstruct and fall apart. It's almost like the natural cycle of things. We have winter where everything dies, and then it's reborn the next spring. When you don't allow that, when the grip on something is too hard, it becomes institutionalised. It's in danger of becoming cult-ish. That's the problem. Tony: It's an irony that such insights should be coming out of the Anglican church, because the Anglican church itself is institutionalised. Rob: Absolutely. These are the challenges. One of the beautiful things about what I do is that I get to go round all these organisations and churches and see how they operate. In every one of them, if you're not careful, you can see some sort of institutionalisation happening. It's inevitable, and I think the Church needs to be, generally, open to being taken apart, deconstructed. That's important, and it's tough, it's painful. It really is painful. You think, No, this is how we do it. I was talking to someone up at Scargill and they said they had kind of a worrying moment when somebody that lived there said "This is how we do it," because actually we don't want to be stuck too much in that. I think that's a really healthy thing. One of the songs on 'We All Write The Songs' is "Hold Lightly". I'm a person with lots of dreams, lots of ideas, and we've had an idea about doing some kind of retreat community type thing, and somebody said to me, "Hold it lightly." It was a word that, for me at the time, was bang on, and it's been really helpful. But I think so often in the Church we need to hold lightly the structure of what we've got, the tradition if you like, and allow God, you know, you've not let go of it completely, you've still got it in your hands, but not gripping it and if God wants to take it away, if it's supposed to be deconstructed, then it will be. Tony: Moving away from church and church structures, you would admit surely that most musicians are very driven people, and they have this passion, zeal, for music which drives them forward. How do you hold that lightly? Rob: Good question. It's interesting because there's two ways to answer that. You can have a formula. I recently watched the new Bohemian Rhapsody film, and there's a bit where they're in the record executive's office and he says, "Yeah, but I like formulas. They work." They say, "No, we've got to think outside that." In terms of what you do and what you produce, that's important to be able to say right, okay, think about what you're writing about. One of the problems with the Christian music industry, scene or whatever you want to call it, is that there is a formula on how to write a worship song. And that takes away the life of writing a worship song. You need to be able to hold lightly the fact that, actually, when we're writing for the Church, for people to sing, we've got to let go of all our preconceptions of what we think works, and allow God to speak and allow the Spirit and our creativity to move on a much more honest level. Over the 14 years that I've been doing this as a job, I've constantly gone back to God and said "Is this right? Am I doing the right thing here?" There's been dry spells where I've thought, "God, okay, if you don't want me to do this, I'll get a job. I'll hate it, but I'll do it." It's a little bit like one of those Isaac/Abraham situations, where you lay it down and suddenly something happens and God provides. I was really worried this year, I went full-time wondering how on earth I was going to make this work. And it seems to be happening, and I don't know why. But things come up. I think that answers your question of holding it lightly.